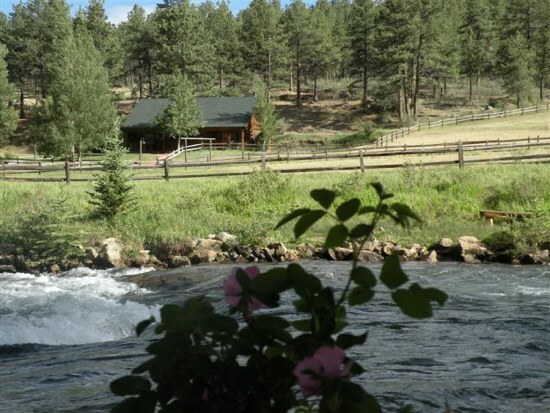 I’m sitting in a rocker on the porch of the Wildhorse Lodge at the North Fork Ranch in Colorado listening to the soothing voice of the Platte River. Wood rose, horsetail ferns, and aspen trees shimmying in a warm breeze line the shore. 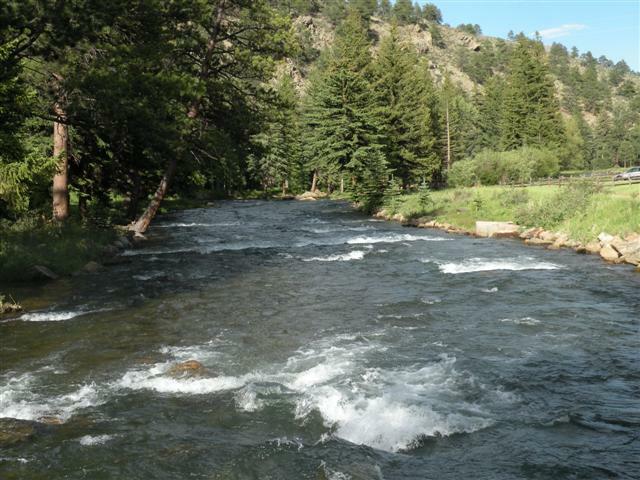 Ponderosa pines flank the far bank of the cooling flow famous for prize-winning trout. Guests are congregating for happy hour on the porch as the scent of spareribs cooking to succulent perfection floats on the evening breeze. Jim, who is here with extended family for Father’s Day, told me he loved his fishing guide and couldn’t remember having more fun fishing. For many of guests, the ranch is like a second home they return to return to year after year. Two families with small children are here enjoying a reunion. I am a solo traveler, but I feel very welcome in this family friendly environment. 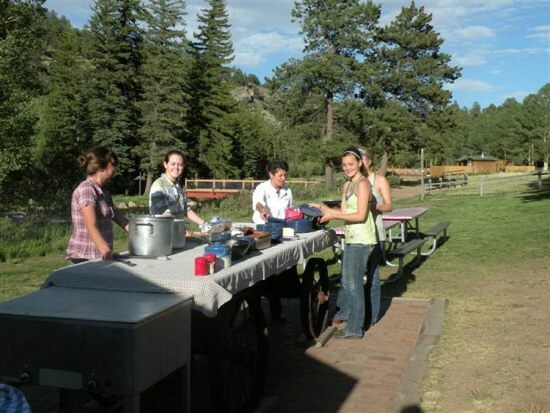 Everything is taken care for you at the North Fork Ranch. 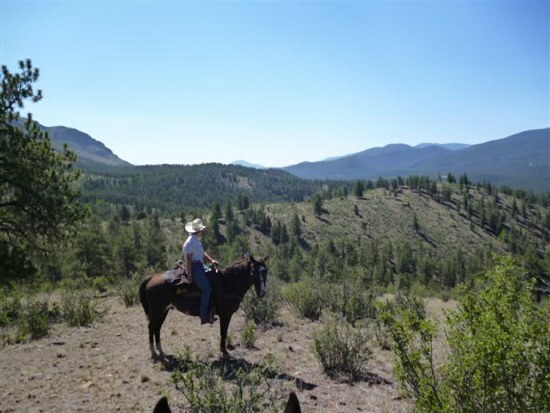 Short stays are offered, but a week at the ranch allows you to get into the rhythm of country life and enjoy a complete rest. 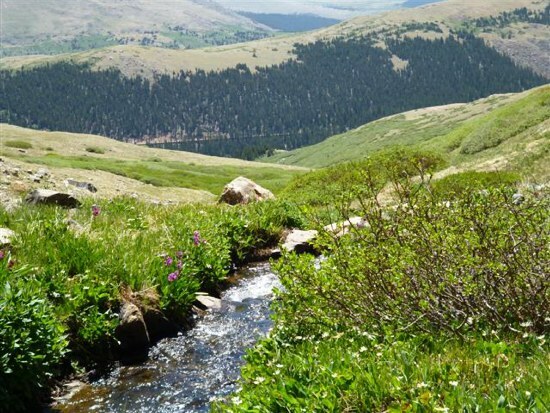 The biggest decision to make is whether you will take a day ride with a picnic lunch, try your luck fishing for rainbow trout in the clear waters, venture over to Breckenridge with a stop at Conifer for zip-lining, hike to an wondrous alpine lake, dare a day of white-water rafting on the Arkansas River, or just laze around the ranch. Scheduled activities for kids are overseen by staff and allow parents to have the day off. Non-riders have lots of options making this a perfect family holiday. My first ride took me to vistas of the lush river valley that once beckoned tourists to summer resorts tucked into the hills of nearby Shawnee. A hastily constructed narrow gauge track built for gold-mining operations up valley in the 1800s became the fastest way for wealthy “Denverites” to get to the woods. 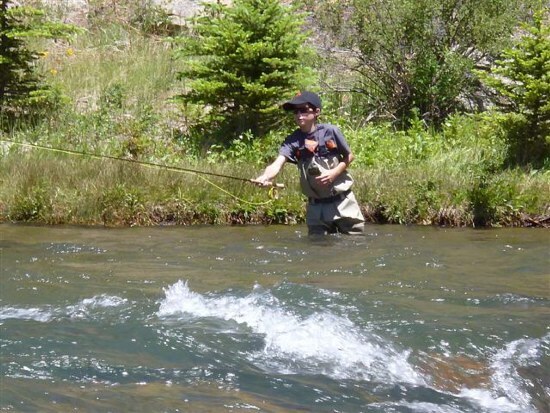 Stately lodges blossomed and throngs came to relax and catch trophy trout. Fire, the largest natural threat to those who live in the high country, destroyed the old lodges. Today, Highway 285 follows the track of what was dubbed the “Fish Train.” North Fork Ranch is a totally renovated, rustic remnant of those days gone by. We crested the hill and dipped into a shady aspen grove then veered off trail to “bushwhack” through lodgepole pine and spruce. Meandering through the forest on a bed of dropped needles is good conditioning for the animals and is a chance for the wranglers to see how well novices are handling their mounts. 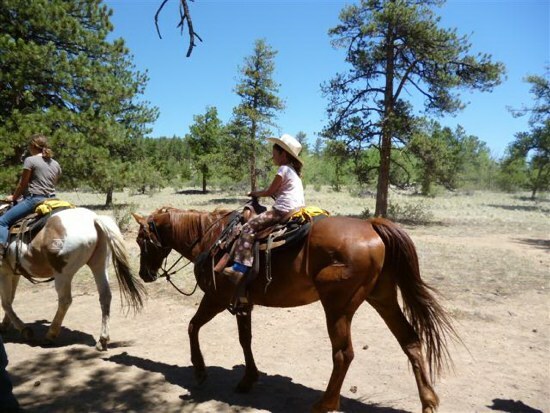 There are horses available to accommodate all levels of riding ability. The wranglers allow you stretch your abilities safely. They strive to give you to have an authentic, out-of-the-arena riding experience. My mount for the week is a sure-footed fellow who was once used as pack horse. After an hour of climbing to where our breakfast was waiting, he had not broken a sweat. The smell of sizzling sausage filled the crisp morning air. Mimosas were served with country potatoes and quiche. Adults rested in the shade after breakfast while the kids and staff played a game of softball. Our afternoon ride took us into the National Forest wilderness area populated by elk, deer, coyote and the nocturnal mountain lion. Beginners soon flagged and went back to the ranch. I went on with my wrangler guide to enjoy the quietude of seldom seen backcountry with a cooling wind blowing up canyon. We had a lope or two but the sometimes steep and rocky terrain is best done at a walk. As we neared the Platte River Valley I could hear the rush of the water and was eager to get back to what now felt like home. A dip in the refreshing pool removed all memories of dust on the trail as I watched powder puff clouds drift across blue skies. The vast unbroken beauty of Colorado set my mind sailing. The less-traveled Platte River valley about an hour southwest of Denver has cast a spell over this cowgirl lucky enough to explore its secrets. For more about the ranch read my Interview with Karen May in my June article at www.NABBW.com.